Staff was amazing and so was Doctor Hatem . Answered all my questions and actually took his time talking to me. Look forward to all future visits..
Dr. Hatem Hatem attended the St. George's University School of Medicine, where he earned his medical degree. He is a reliable OB-GYN serving the community of San Antonio, TX. He conducts exams and consultations at MedFirst Zarzamora. Dr. Hatem completed his residency in obstetrics and gynecology at Newark Beth Israel Medical Center and Atlantic Health System. He is certified by the American Board of Obstetrics and Gynecology. 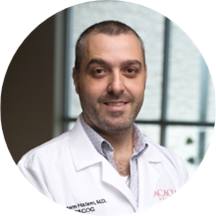 Dr. Hatem is passionate about guiding women during the most critical times of their lives, which include adolescent stages, pregnancy, and menopause. He believes in caring for his patients and addressing all their medical concerns. Was very pleasant, answered all my questions. Did not feel rushed at all. Generally concerned about reason for your visit and addresses all questions/concerns you may have.